I’m pretty sure you could put anything you like in these muffins for a portable side dish, lunchtime option, or silly addition to an all-muffin meal. “Two cups of stuff” doesn’t make for a very good recipe, though, so I nailed down an exact structure for you to follow, then some recommendations to adapt to your tastes. When I was brainstorming sides for my silly muffin meal, I knew I wanted something with vegetables, and I also happened to have some leftover cooked brown rice in the fridge. I thought about the veggie fried rice I recently posted and wondered if it would go well in muffin form. Then I thought about the huge amount of zucchini I had in the fridge. They held together better than I expected and would travel quite well, even in a lunchbox as long as your kids don’t mind eating cold rice. Any meal my kiddos can eat without touching a single fork? Golden. Simply mix well in a bowl and press firmly into lined muffin cups. Bake at 400F for 18 minutes or 11 minutes for mini muffins. Pop out of the paper cups ASAP and you can reuse the cups for other muffins, especially if you make these meat muffins for dinner, too. Serve with optional soy sauce or butter. * To reheat: bake about 5 minutes in a 350-400F oven for minis, a bit longer for full sized muffins. Very simple! They’re not bad cold, either. Makes about 6 large muffins or 12 mini muffins, depending on how full you fill the cups. * Mexican: Use cilantro instead of the parsley and add a squeeze of lime. Try red peppers, black beans, red onion and/or tomato instead of the zucchini. Serve with salsa. * Asian: Add ginger and curry to the mix; try a variety of veggies. Mimic the flavors of this fried rice recipe. * Italian: Use EVOO and Italian seasoning in the rice; serve with spaghetti sauce. 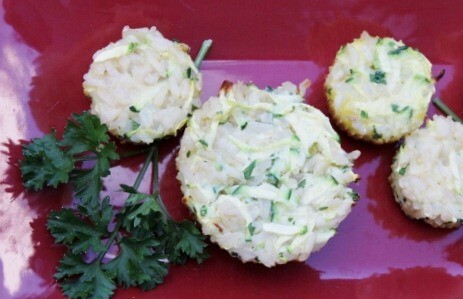 * Grain-free: delete the rice in favor of another cup of vegetables, perhaps using some sweet potato for stickiness. What’s in your fridge that would make a fun muffin? Disclosure: See my full disclosure statement here. Just had to share! I made these muffins with a little grated cheese and onion added for my 20 mo old while I used the same ingredients to just make a side dish for my husband and I for dinner. He, my husband–not the kiddo, snuck one of the mini muffins and wouldn’t quit eating them. My plan to freeze a bunch went out the window. The side dish was hardly touched, so I guess I’ll have to make more muffins with it. 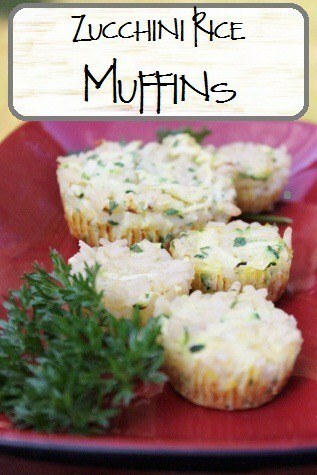 Great muffin idea! Try it with the cheese…mmm. I used a little white cheddar and Jack mixed. This recipe looks awesome. Can’t wait to try it. Have you ever tried making a bunch and freezing them?